First, upload a document to a content type with a Document body and move it through a workflow where you review it and edit it as usual. 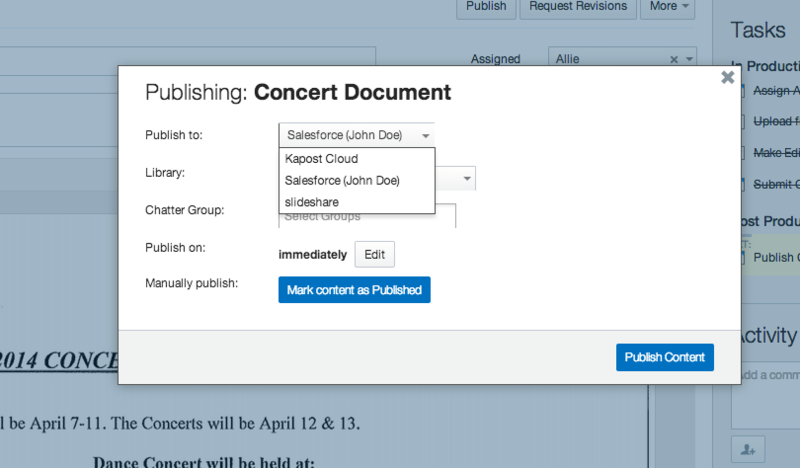 2) Once it's ready to be published, click the Publish button and select where you want to publish that document (you can publish it to the Kapost Cloud if you want Kapost to host your document). 3) Once it's published, we will generate a tracking URL that wraps the published URL you see in Kapost. You can then include this tracking URL on your landing pages, or anywhere else you would like to give people access to your document. 4) If you update or change the document, simply upload the latest version to Kapost (using the same file name as the old one) and republish that version to the original destination. The tracking URL and published URL will not change but will now point to the latest and version. There will be no need to update links in Kapost or on your landing pages. Note: The only way to change the document URL is if you manually update it using the Update URL button. When you do that, Kapost will automatically generate a new bit.ly link. If you have any questions about this, don't hesitate to email us at support@kapost.com.